-After 3 days without data updates we are back to normal daily update frequency. v1.4.3 makes minor adjustment to 'weather impact'-algorithm. When you download a new version (update) of The Handicapper, your previously submitted bets have to be added for them to show in Archived Bets and Past Performance. 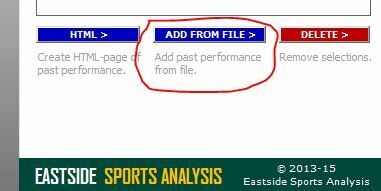 Press the Add From File-button in the BET HISTORY-menu of The Handicapper. Your submitted bets are stored each time you save The Handicapper by pressing the Save-button in a folder named Saved_Files (located in the same folder as The Handicapper-excel file). v1.4.2 should fix latest issues. The Handicapper works well for most users and on most computers, but from time to time, and especially after some new features have been added, some users have encountered problems. The software is a constant work in progress, but I hope that after this update (v1.4.2), there will be no need for major updates in a while.